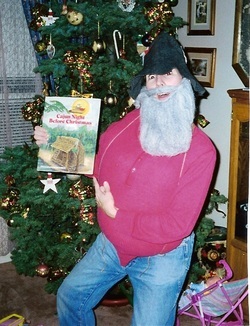 Before my own books were published, I loved being the storyteller at my kids’ school. It was fun to dress as a character or wear a funny hat or some get-up to grab the students’ attention. 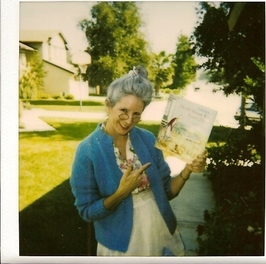 Cynthia Rylant’s picture book, The Old Woman Who Named Things, is a big hit for reading aloud in classrooms, especially if you dress up! Kids of all ages get the biggest kick out of the picture book Cajun Night Before Christmas by Trosclari. It was a hit with middle schoolers and teachers, too. I also read it at the family get-together on Christmas Eve. 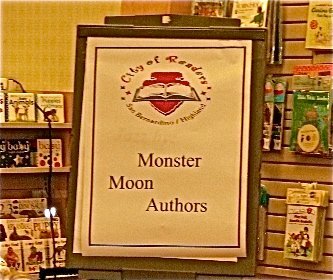 Nov. 17, 2012: Barnes & Noble, Redlands, CA, 11:30 a.m. – Monster Moon authors, BBH McChiller, book signing and excerpts read from both Monster Moon books. Nov. 19, 2011: Barnes & Noble Bookfair, Redlands, CA. 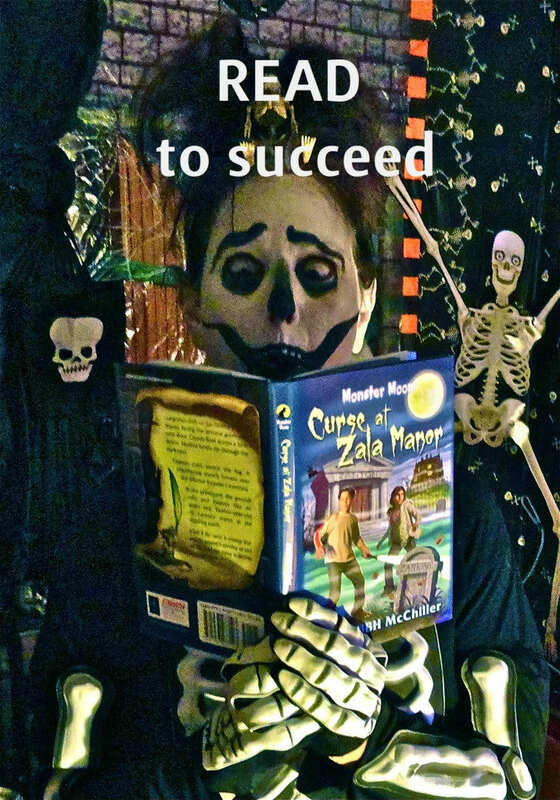 BBH McChiller, Monster Moon Authors – book signing and reading. Oct. 21, 2011: Luncheon Lecture – Cal State San Bernardino, Guest Speakers. 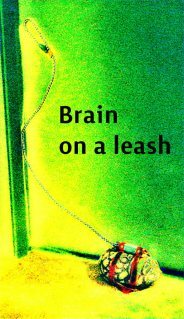 Oct. 1, 2011: Author visit – Western Science Center, 2345 Searl Parkway, Hemet, CA. 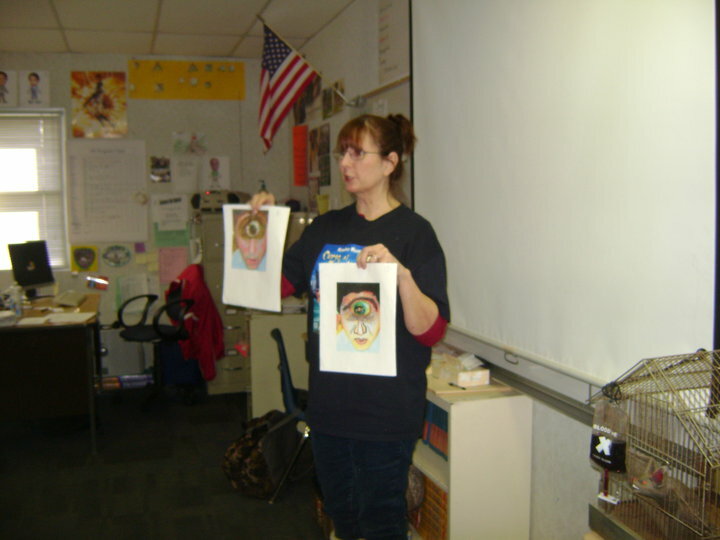 May 10 – 12, 2011: Village Elementary School, Victorville, CA, author visit – Related blog posts, Props for School Visits and Reading Aloud at School Visits. 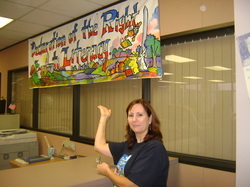 May 9, 2011: Sunnymead Elementary School, Moreno Valley, CA – Author Fair. 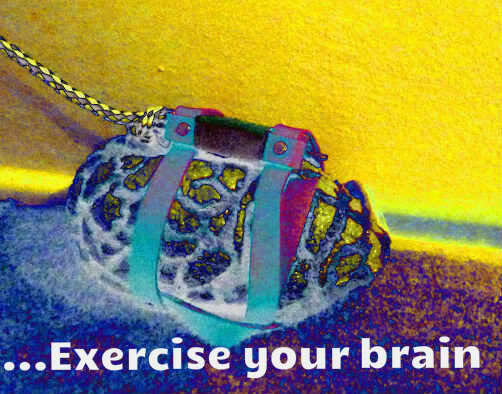 March 26, 2011: Schmooze presentation by Lynn Kelley – Red Herrings & Clues in Your Writing, Barnes & Noble, Redlands, CA. Mar. 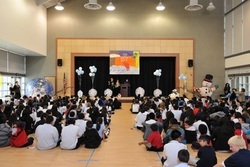 12, 2012: Read Across America Day to celebrate Dr. Seuss’s birthday, Cooley Ranch Elementary School, Colton, CA. Mar. 4, 2011: Read to Succeed, Monterey Vista School, Monterey Park, CA. Mar. 3, 2011: Read Across America, Cooley Ranch Elementary School, Colton, CA. Mar. 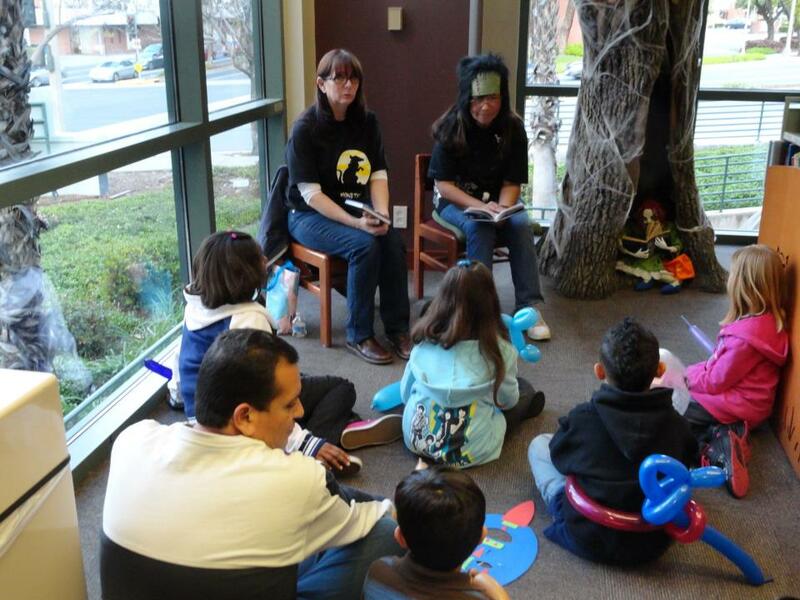 2, 2011: Read Across America, Feldheym Library, San Bernardino, CA – 4:00 p.m. to 7:00 p.m., book signing and reading. 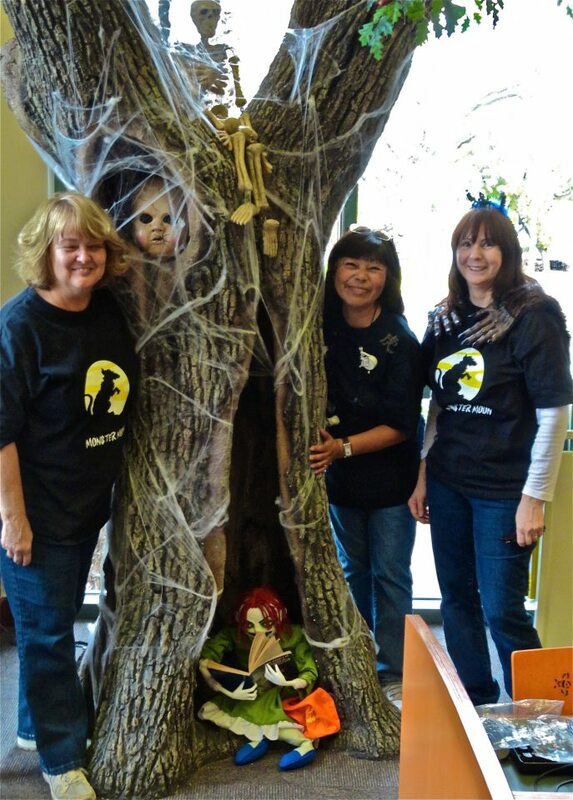 Feb. 26, 2011: California Readers Assoc. Luncheon – Burbank, CA. 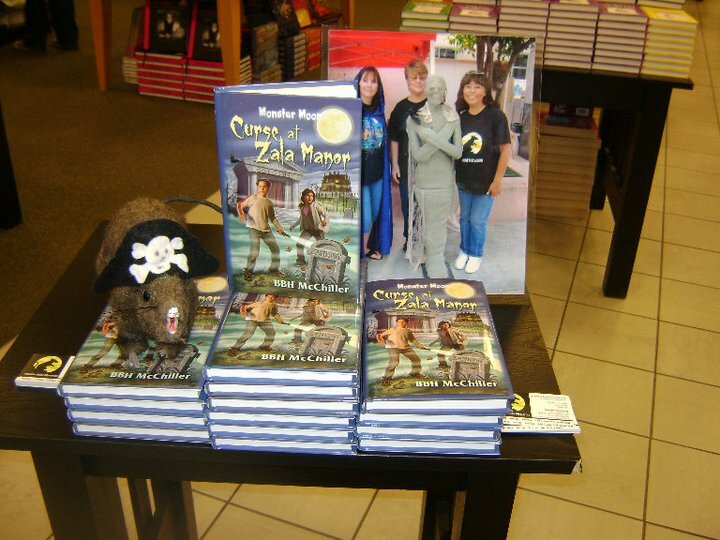 Dec. 15, 2010 – Redlands Barnes & Noble, Cope Middle School Bookfair – book signing, excerpts of Curse at Zala Manor, presentation on writing. 4:00 – 7:00 p.m., 1955 Hunts Lane, Suite 102, San Bernardino, CA. 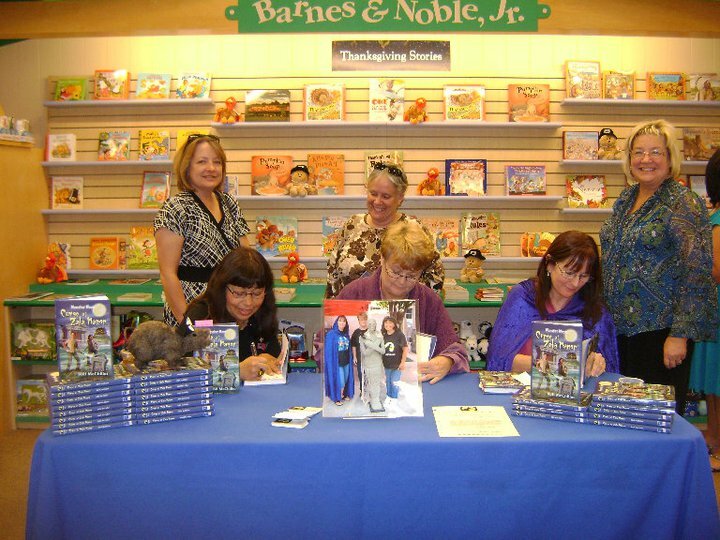 November 14, 2010 – Barnes & Noble, City of Readers Bookfair, Redlands, CA, book signing and reading. 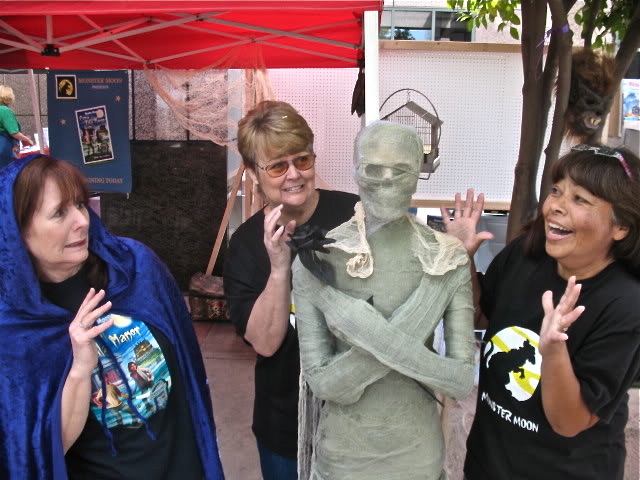 Oct. 24 – 26, 2010 – Ghost Walk, Riverside, CA. 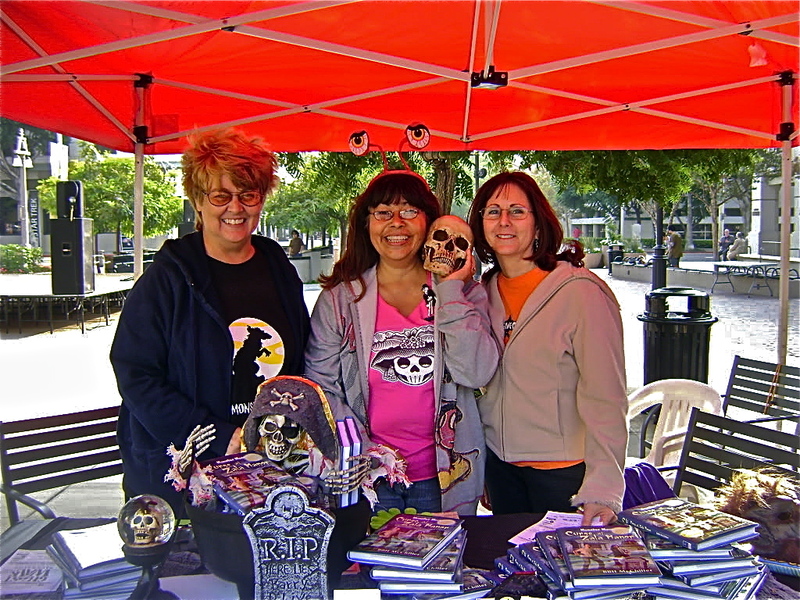 Oct. 16, 2010 – Downtown Riverside Street Jam, Downtown Pedestrian Mall/Kids Jam. Barnes & Noble, Redlands, CA, Oct. 14, 2010. 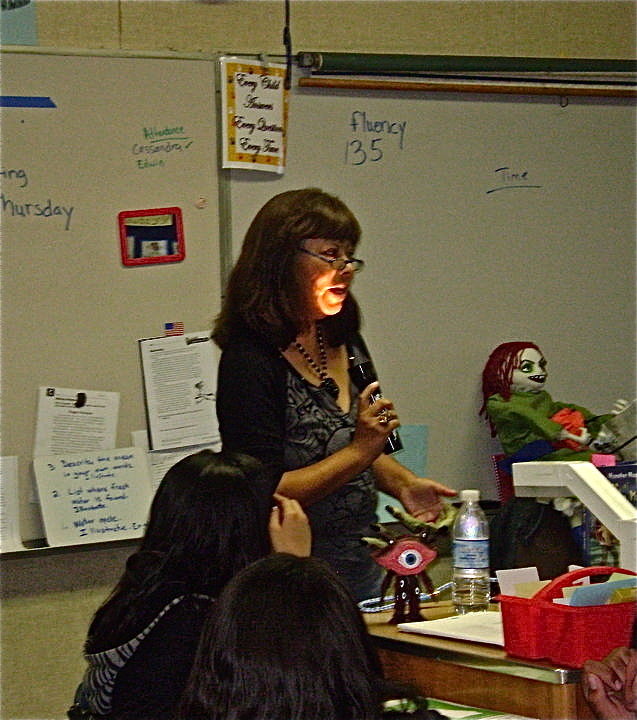 Oct. 7, 2010 – Read For the Record, Valadez Middle School Academy, Placentia, CA. 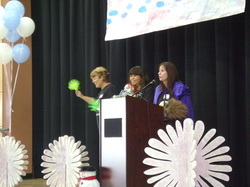 Sept. 23, 2010: Alcott Elementary School, Riverside, CA, Dinner on the Green, author readings. 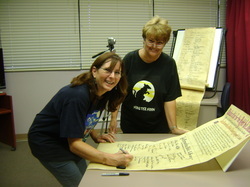 The scroll made its way across the country, gathering signatures along the way, and was then presented to the White House. 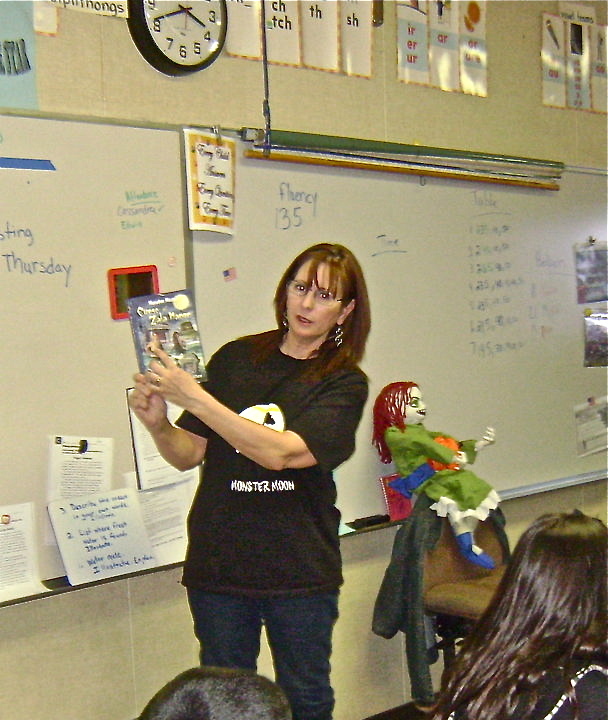 April 7, 2010: Celebrity Read-In, Monterey Elementary School, San Bernardino, CA. Mar. 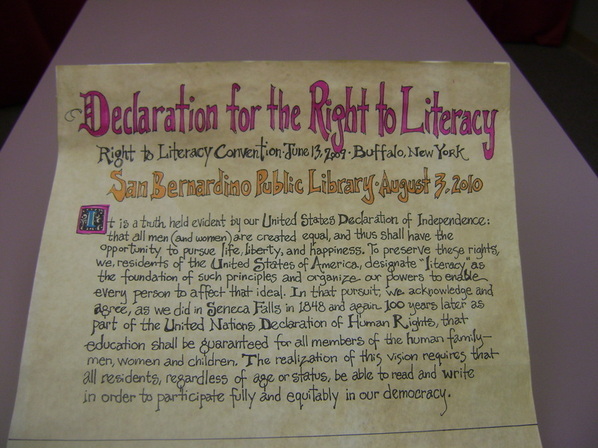 24, 2010: City of Readers Community Meeting, Community Center, San Bernardino, CA. 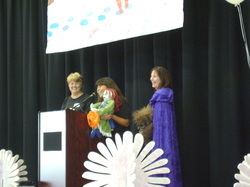 On Oct. 7, 2010, the Monster Moon authors, Maria Toth (with Scary-Lou), Kathy Sant (with Brain on a leash), and I (in my werewolf getup), danced our way onto the stage to the tune of Ghost Busters, for the opening of the Read for the Record event at Valadez School in Placentia, CA. The auditorium was filled with 1st grade students from Melrose Elementary and Rio Vista Elementary, and 7th graders from Valadez. Keynote speaker, Maria Toth, an ex-student who attended the same site when it was McFadden Elementary School, pumped the kids up for the Reading Buddies to participate in breaking a record for the most kids reading the same book across America in one day. ex-student turned author until after she invited Maria to be the keynote speaker. Maria was flooded with memories from her kindergarten days and also spoke of her father’s boyhood experience during the 1938 flood that ravaged the area. Students and teachers alike were surprised to hear how teachers during the flood had placed students on top of cabinets when the water kept rising. Sadly, the eight-foot high wall of water claimed many lives during what’s now known as “the Great Flood.” And, holy cow, Maria’s dad’s childhood home was washed off its foundation and carried down the street. After sharing details about the flood, Maria played a version of Simon Says, only it was named after Scary-Lou, the doll she brought. “Scary-Lou says if you love to read, yell as loud as you can to raise the roof for reading!” The students played along and had a good time hollering at the top of their lungs. When Maria finished her keynote speech, Kathy spoke about the importance of reading to become whatever the children dreamed of becoming someday. “How many of you want to become rich and famous?” The crowd roared with enthusiasm. “Or a teacher? A lawyer? A fire fighter? An actor?” The kids almost raised the roof cheering to become an actor or movie star. I spoke last and shared how I love to be right there in the story with the main character, how cool it is to be dying to know how they get out of a jam and you can’t wait to turn the page, and how you can go anywhere in the world in a story and let your imagination soar. The students were asked to close their eyes, cross their fingers, and wish for a snowy day. Imagine their surprise when artificial snow machines kicked on and sprinkled them with white flakes floating out of the clear blue sky! Flaky fun on a warm, sunny day! After our pep talk, each first-grader was paired up with a seventh-grader. They picked a spot outside, and the older Reading Buddies read A Snowy Day by Ezra Jack Keats to the younger ones. Once they finished reading, the first-graders were given the book to keep. Then each student taped a snowflake onto their class snowman mural. Ms. Cuesta expected the number of students participating in “Read for the Record” to be about two and a half million. Each student taped a snowflake on a snowman when they finished the book.